Medical Supplies Depot knows that selecting the right products and equipment is only part of the challenge faced by our customers. Without competitive pricing, any supply program falls short. With this in mind, Medical Supplies Depot offers our customers a price match program that is very simple. We will match any competitive healthcare distributor's everyday price on any product we carry and lock that price in for 12 months. 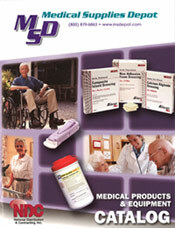 While many things go into the decision to work with a specific distributor such as value-added benefits and service, delivery times, payment terms and ease of ordering, we know that pricing is something everyone considers so let Medical Supplies Depot take the concern of competitive pricing off your mind by allowing us to match whatever pricing you have from other sources so you can experience everything we have to offer. To contact us about pricing on the supplies you use everyday, please click here.